Embroidery thread organization is a question that every stitcher faces, eventually. How should I organize my threads for this project or that project? You’ve probably pondered this point at least once already in your stitching life, right? And especially if you travel with a project, thread organization becomes more of a quandary. You want your threads handy, easy to access, neat & tidy, but you also want them compact, easy to slip in a bag, a briefcase, a backpack. Well, Julie over at The Floss Inn has come up with a rather ingenious solution to compact embroidery floss storage for stitching projects. I think you’ll think it’s pretty neat and clever! There are so many things to like about it! So let’s take a look at The Floss Inn and chat about pros and cons. The Floss Inn is a compact organizational solution for your embroidery threads while you’re working on a project. It’s not a long-term solution for collections of threads, but instead, a working organizational system that you can easily tote with you wherever you go. It keeps your threads neat, organized, and easy to access. When you look at it from the outside, The Floss Inn looks like a little rolled bundle of fabric held closed by a fabric-covered elastic band. 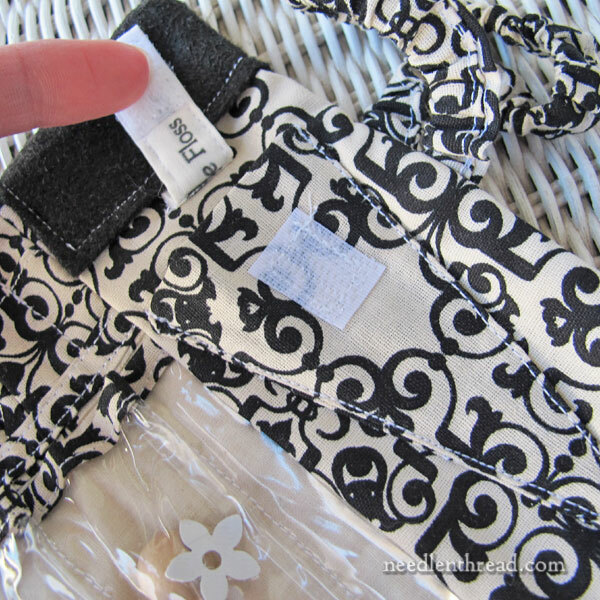 When you unroll the bundle, inside, you’ll find a strip of narrow clear vinyl pockets that hold small dumbbell-shaped wooden bobbins for your floss. 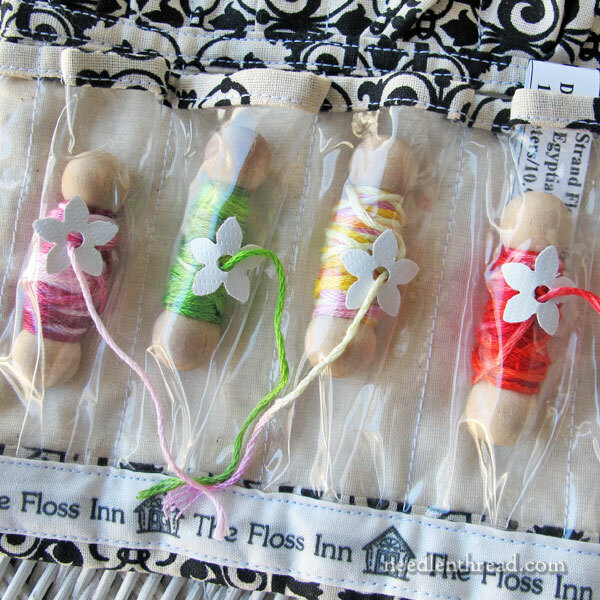 The Floss Inn can have anywhere from 10 to 100+ little pockets for those bobbins! So whether you work big or small, you can find a Floss Inn that will accommodate your projects’ threads. Each vinyl pocket accommodates the included wooden bobbin (which you wind with your own embroidery floss) and a small tab of card stock, onto which you can write the color number of the floss. I just inserted the label that came on the floss I’m using into the pocket, rather than writing out a new tab. Each clear pocket has a reinforced hole in the front center, through which you pull the end of your floss. Because the bobbins are round and they turn as you pull the thread, when you need a new length of floss, you simply pull the little tail hanging out of the hole and cut the length you need. 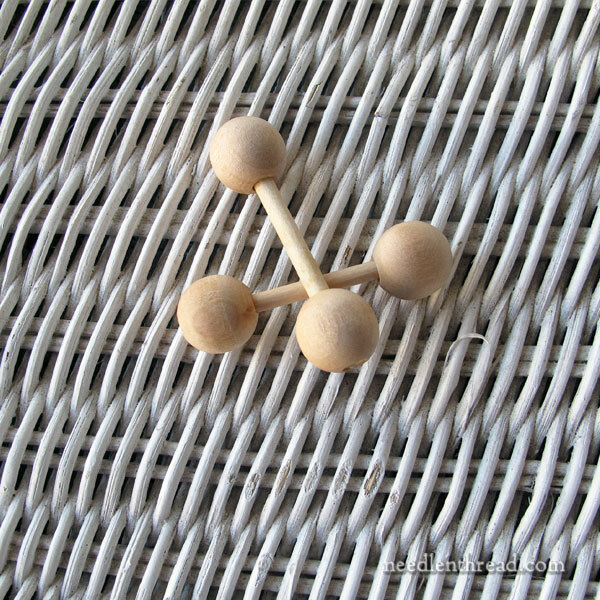 These are what the little dumbbell bobbins looks like, and I think each Floss Inn comes with a couple extra for good measure. Mine came with two extra. They’re smooth and they work well as thread bobbins. They are small though. You can fit about one skein of regular floss on them, creating a pudgy little package. Because I’m using a skein of overdyed from Colour Complements on my bobbins (which are much larger skeins than your standard skein of floss), I couldn’t fit the whole skein on the bobbin. But I could fit as much as I’d need for what I was working on, which works out great when setting up a traveling project. A couple little details that make each Floss Inn the great organizational solution that it is: there’s a little triangular pocket to tuck your embroidery scissors into, and a little square of softer fabric above the scissors, where you can slide a few needles. So, scissors, needles, thread – everything you need to stitch with, aside from the fabric in the hoop. This is my 10-bobbin Floss Inn, all rolled up. Nice and small and compact – and attractive, too! I love this idea! I think Julie has come up with a really fantastic solution for organizing threads for embroidery projects. I think The Floss Inn would be super-useful for any kind of project, whether home based or on the go. But I see it especially useful for folks who take their projects with them traveling, commuting, running errands, waiting for appointments and the like. I also see it as a great solution for folks who have very limited space for stitching and who want to keep all their stitching stuff compact and tidy. The Floss Inn that I have is a 10-bobbin roll. I think perhaps the 15 or 20 bobbin roll would be more universal, but when I’m running about and toting a project, it’s usually a pretty small project (like a monogram), so it doesn’t require many different colors of threads. 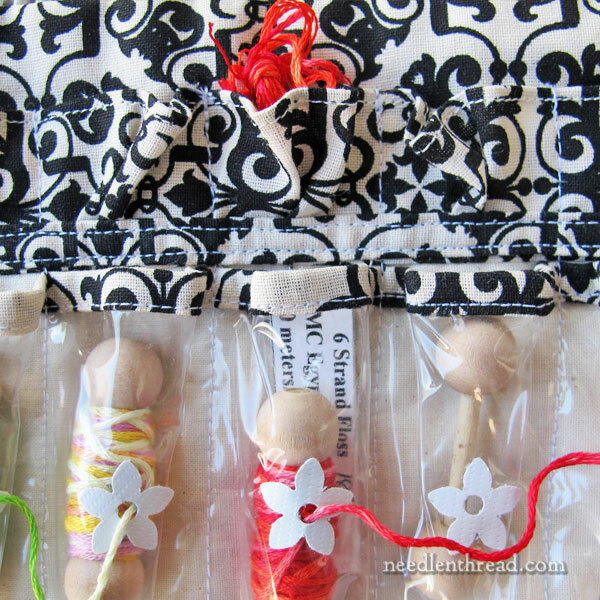 Julie also offers extra bobbins and small ziplock bags that you can store individual bobbins in, when you trade out for different projects. You put the ziplocks on a ring, and you have a fairly compact way of storing the bobbins, already wound, for the next time you need them. So I think that’s a good idea, too! You can also choose a custom fabric for your Floss Inn, which is a great concept. Hopefully, as Julie explores and expands her offerings, the fabric selections will expand, too. I’d love to see some of the popular Scandi prints, maybe some higher end cotton prints on the quilting market (some of the bold and colorful Kaffe Fassett fabrics would be wonderful!) and so forth, available. Bobbin winding is not a favorite activity of mine. I know there are many folks out there who love to prepare their threads by winding them on those square little bobbins. That’s just not my Thing, I’m afraid. But I’m so glad these bobbins with The Floss Inn are round, so there’s no kinking in the thread to deal with. And, to have a compact, clean, tidy storage solution for travel, I’m willing to wind these bobbins! The Floss Inn is not inexpensive. But it’s an individually hand-made item, it’s a well-made item, and it is made up of a lot of components. It should last for years with normal use and care. I think the price is reasonable for the product, for the time and materials that go into making each one. Right now, the fabric selection is a little limited. Like I mentioned above, I hope to see the fabric selection broaden a bit across all sizes of Floss Inns, with a few more trendy fabrics and a few more classic fabrics mixed in. 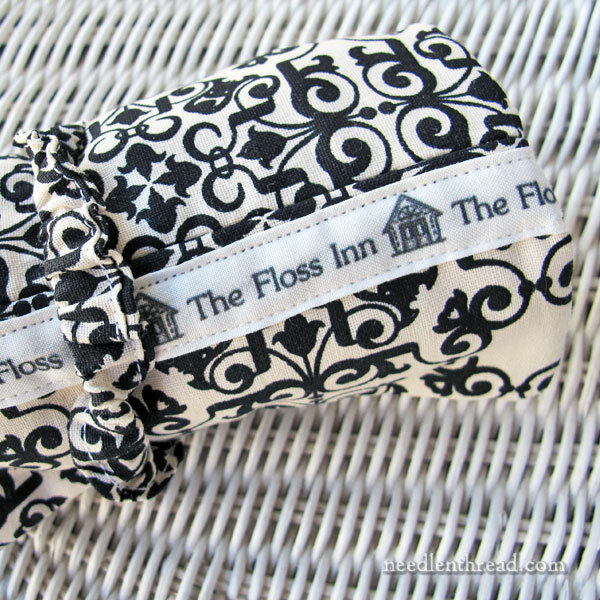 You can find The Floss Inn available on The Floss Inn website, where you can read about how it works – there’s even a little video – and you can shop for your preferred size and fabric. The photos on the website don’t quite do the things justice. So, that’s The Floss Inn! A pretty clever idea, and neat and tidy thread organizational solution for those who like to keep things compact and portable! What a great idea! People’s ingenuity and creativity always amazes me. This is a delightful way to carry embroidery supplies! Thanks for showing us! That’s so cute! Knitting yarns have used this concept of pulling out of a hole or slot, so this is smart for embroiderers. The Floss Inn is a great idea for storing current project threads and I really like the bobbins and the easy access to individual threads and easily stored for travel, very well thought out product. I have to say they are not cheap but as they are individually hand made and has lots of components to them, then the price is reasonable for the product. 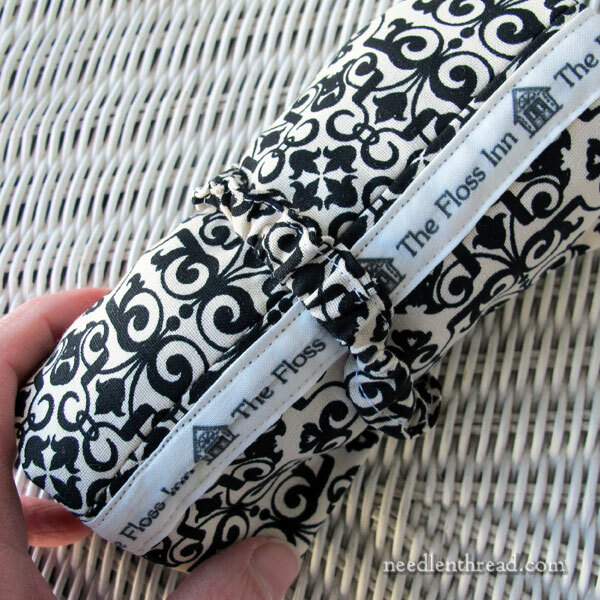 Thanks for sharing with us the Floss Inn thread organiser and photos very handy accessory. So clever! I hate the cardboard bobbins and all the kinks, so this might be a nice alternative, especially for take along projects. I’m still trying to figure out a long term floss storage solution that doesn’t involve bobbins but still allows it to be filed by number… although it will take me a long time to use up what is already wound on them! This is a repeat of something I submitted before for storing floss. The floss number is written on a 5×8 card. The card is placed in a plastic sandwich bag. The corresponding skein is placed behind the card. Any separated strands or orts are placed in front of the card. The baggies are stored upright in numerical order in a decorated cardboard box from a craft store. Shoe boxes also work. This is a pretty inexpensive solution and I’ve been using it for years (now have four boxes of floss) I’m not sure what impact the plastic would have on the integrity of the floss so that might be a concern. I remove the baggies I need for a project and place them in numerical order in an oversized make-up bag with a zipper. Easy to keep organized and will hold quite a few colors. As to my basic kitchen-towel-roll, I’ve mentioned and showed and credited it on my website. I would like to try and link it again in this text, but after you informing me about the spam flagging, I’m a bit afraid. I’ve read on facebook and in a forum, that this could be because the link was too long (e.g. to a subpage), and that one should try to exclude the “https://” in the link. I tried both in my personal data above under “Website”. Would you be so kind, Mary, as to check it out again? Your comments are coming through now, Angela! Oh Angela! I have not seen your idea! LOL Curious! I looked around online to make sure there was nothing like my idea too! Would love to see your kitchen towel roll. I do ship to Europe. Thanks, Mary, for checking out! You say comments – but does my website link come through as well? BLESS YOU, Mary! Reading this made all kinds of lights go on in my head. I am a nomad stitcher in my own home and hate carrying my tools and project to the day’s preferred stitching cove. This little sweetie is on its way to me right now! (Ready made in a fabric I love!) Julie’s story is incredibly inspiring, too. Thanks for the intro! That is a neat idea! I usually have a little plastic box that I tuck in the bobbins of whatever colors I’m using for a project. 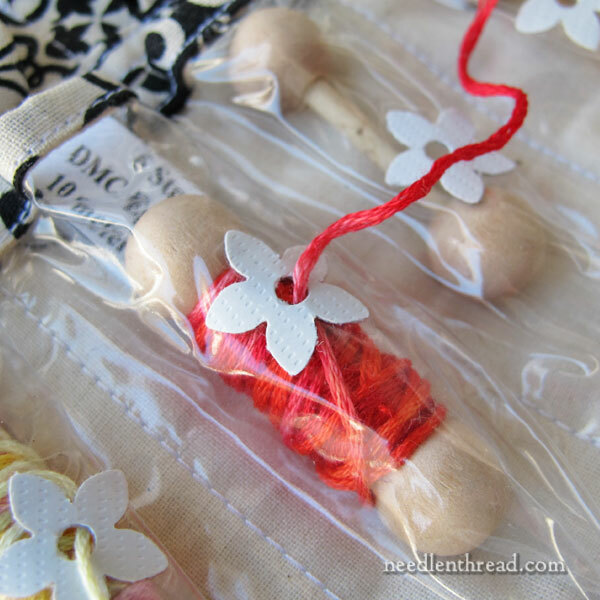 It only holds up to about 12 bobbins though, less if I want to put scissors in the same box for travel. I especially love the little pockets for leftovers. Those are the bits that always end up in a tangled mess in my travel sets. Thank you so much Mary for such a wonderful review! And thank you everyone for your interest. I am always struggling with what pattern of fabric to purchase as I have my own likes and have to force myself to buy blues! Any suggestions of prints is appreciated!!! If anyone is interested they can contact me in regards to having their own fabric used. Also, customers can contact me if it appears I am out of a size or choice, and I can put them on a list. I kind of got overwhelmed with customers thanks to your post! I just use scissors, Louisa. Another wonderful post on this great travel thread organizer! I lug my stitching everywhere with me. I liked the article /description so much I clicked right over to the Floss Inn Website and ordered one. I love llamas so that is the one I ordered. Now I can’t wait for it to arrive! Now I am shutting down my computer so I am not tempted to purchase anything else! 🙂 Thank You Mary, for another informative blog post!